“Fascist Warships in Dublin Bay” (July, 1938) | Come Here To Me! « Five tips for Culture Night. In July 1938, two ships of Italian cadets from the training ships Christopher Colombo and the Vespucci visited Dublin. Their presence here brought about significant interest, and there was a warm welcome towards the cadets, but also some rowdy scenes and protest, with the New York Times giving front page coverage to an incident on O’Connell Street where the cadets were confronted by locals. Interestingly, one of the ships which visited Dublin in 1938, the Vespucci, was here only weeks ago as part of the Tall Ships Festival. I was on board it in Dublin, with no clue of its historical connection to this very city! Now we are to have a visit from Mussolini in the form of cadets in a training ship. The friendship of these two regimes is universally known and the rebut which His Holiness the Pope delivered to this friendship on the occasion of Hitler’s visit to Rome is equally well-known. There had been considerable interest in the visit in the weeks leading up to their arrival in Dublin from the mainstream media too, as evident from coverage like the below. The Irish Times, July 6 1938. The two Italian ships arrived in Dublin on 22 July, beginning their five-day stay in the Alexandra Basin. The officer commanding the visiting Italians was Bruno Brivonesi, who would later go on to play a leading role in the Battle of the Duisburg convoy, where the British Royal Navy inflicted heavy losses on the Italian navy, which was attempting to supply Axis troops in North Africa. When the Italians arrived in Dublin, soon after 8 o’clock in the morning, their ship fired a 21 gun salute and raised an Irish tricolour alongside the flag of Italy. The salute was replied to by a battery of twelve-pounders, fired by the Irish army, at the East Pier of the Dun Laoghaire harbour, where the Italian flag was then raised. 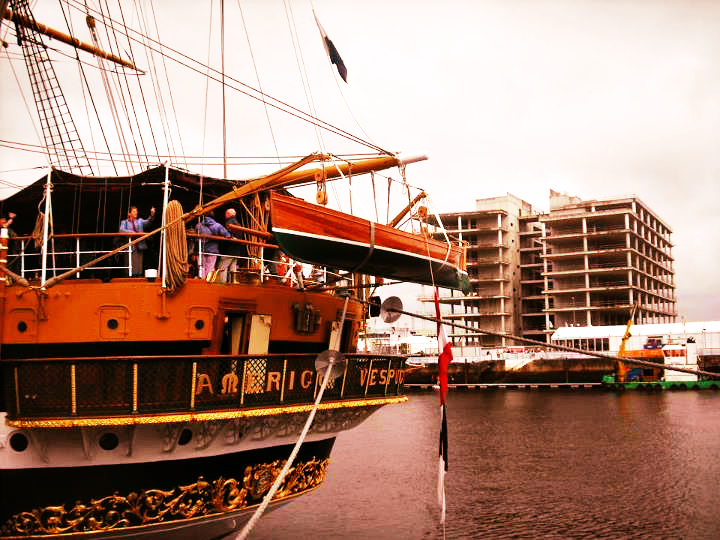 Both the vessels are fully rigged, three-masted ships, with auxiliary engines. The Vespucci is 3,535 tons, and carries 24 officers, 190 cadets, 34 petty officers, 247 seamen and 48 civilian workers. The Colombo is slightly smaller, 2,790 tons, and carries 21 officers, 115 cadets, 32 petty officers,260 seamen and 36 civilian workers. Both ships were equipped with anti-aircraft firepower. Ironically, following the defeat of fascist forces in World War II, the Colombo was handed over to the Soviet Union as part of the war reparations demanded by the Paris Peace Treaty. During their stay in Dublin, the Italian cadets celebrated mass on board the Vespucci ship in the presence of the Nuncio Apostolic, and also attended mass at the Pro Cathedral and Saint Andrews on Westland Row. Newspaper reports noted that they were cheered exiting the Pro Cathedral, and that a crowd of several hundred had gathered to do the same at Westland Row. 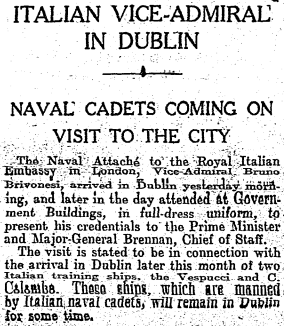 It was evident however that not all Dubliners welcomed the Italian cadets. The Irish Times reported that posters had appeared around Dublin which noted there were “Fascist Warships in Dublin Bay”, and which called on Dubliners to “protest against this Fascist propaganda visit.” Posters told of how “for two years, the people of Republican Spain have fought against the combined forces of Mussolini and Hitler.” Public sympathy around the Spanish Civil War had not rested with the left however in Dublin, and five years previously in 1933, Connolly House, home of the Revolutionary Workers Group, had been laid siege to by a religious mob. 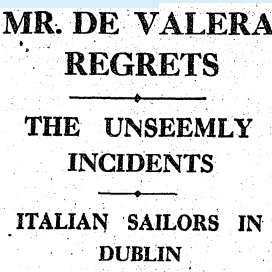 Ugly scenes were witnessed in O’Connell Street, Dublin, last night, when a large crowd of Dublin young men threatened a party of Italian sailors from the Italian training ships at present in Dublin Harbour. The crowd grew bigger and assumed alarming proportions outside a cinema, where the sailors were surrounded and threatened. The newspaper reported that during the night there were several clashes in various parts of the city, but that police had prevented any major escalation. In a letter to the paper titled ‘Dublin’s Shame’, T.Kennedy wrote that he found it abhorrent the Italians were here, as they were “the official representatives of Italian forces who have carried out abominable policies by execrable methods”, here only on a propaganda visit. M.J Kennedy T.D slammed the “hooligans” behind the attack in a letter to the national press, and asked how the public would feel had Irish men been attacked in such circumstances in Rome or Berlin. 150 Italian cadets enjoyed tea at Dublin Castle over the visit, but rather bizarrely, one of the events the Italians attended while in Dublin was a screening of a film dealing with Mussolini and Hitler, at the Capitol cinema. The cadets marched to the cinema behind a band. Eamon de Valera was among those who attended a reception in honour of the men at the residence of the Italian minister in Foxrock, along with the Lord Mayor of Dublin. The Sunday Independent described the event as a “delightful reception”. In the end, the Italians left Dublin with a silver replica of the Ardagh Chalice, a gift from Alfie Byrne, the Lord Mayor. The scuffles on O’Connell Street caused considerable embarrassment however, receiving international attention from newspapers such as the New York Times, San Jose News and others. 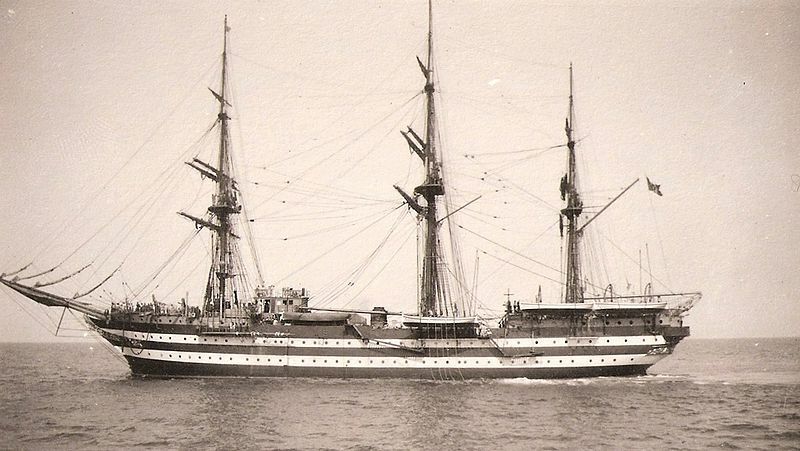 While one of the ships was lost to the Soviet Union following the war, the Vespucci remains an active ship on the seas, as a school ship based in Livorno, Italy. Only weeks ago, Dubliners visited the Vespucci in their tens of thousands! I reckon I know at least four of the protestors at the visit, but they wouldn’t have been the fighting type, although one fought In the Spanish civil war on the right side, if my printer/scanner was working I would put up a drawing of one Frank Edwards! !